Bat-Galim Sh'aar responds to Arab arson attack on synagogue named in memory of her son, Gilad, and 2 other Israeli teens brutally murdered. Bat-Galim Sha'ar, the mother of one of three Israeli teens abducted and murdered in June 2014, responded late on Saturday to the arson of a synagogue erected in their names. Arab arsonists set fire to holy books in the synagogue located in Givat Sorek near Karmei Tzur in the Gush Etzion region of Judea. Givat Sorek sits atop a hill overlooking the site where the three teenage boys - Eyal Yifrah, Gilad Sha'ar and Naftali Frenkel - were kidnapped. The synagogue is used as a prayer house, a rest place for backpackers, and a center for youth group programs. 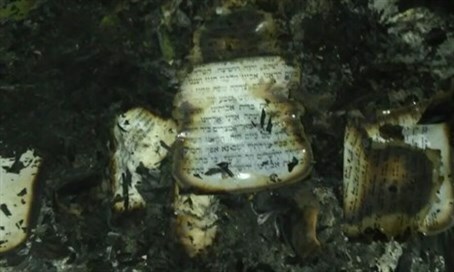 "An attack on Torah scrolls is tantamount to an attack on the soul of the Jewish people," Sha'ar wrote on Facebook. "Those who seek to harm our bodies are not deterred from also harming our spirit." "We will continued to choose life and enhance the spirit of the Jewish people, which is stronger than ever," she added. Countless politicians rushed to condemn the arson on Saturday night, including Prime Minister Binyamin Netanyahu and President Reuven Rivlin. "Last night a synagogue in Givat Sorek, in Gush Etzion, was set on fire by Palestinians," Netanyahu announced on Facebook. "We will prosecute the perpetrators of this crime." "I expect the international community to condemn the desecration of a synagogue, an act that is the result of incessant Palestinian incitement."